The US factory orders increased to 2.3% month-on-month in August, comparing to the -0.5% drop registered in July and stronger than analysts’ forecast of 2.1% rise. It was the biggest surge in industrial orders since September 2017 mainly driven by demand for aircraft. Since the beginning of October, the US industrial index gained over 0.5% and is in a well-established bullish phase since early July. On yesterday session, the Dow Jones 30 initially fell but found enough buying pressure near 26,429 to trim some of its losses and close in the middle of the daily range, in addition, closed within Thursday’s range, which suggests being clearly neutral, neither side is showing control. The stochastic is showing an overbought market and is setting lower highs while the price is making higher highs, signs of a potential bearish divergence. Since July, the Dow Jones 30 has been in a steady upward movement setting higher highs and higher lows all signs of a healthy bullish trend. 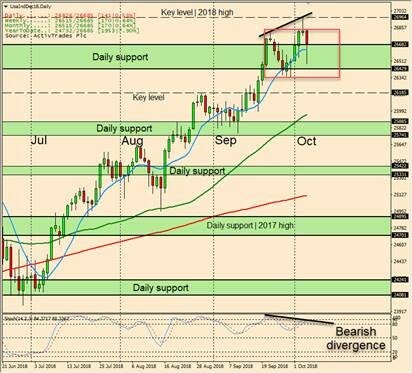 In early October, the index made a new year-to-date high at 26,964 but at the same time is developing a potential bearish divergence that can lead to a downward correction. UsaInd is a CFD written over Dow Jones Industrial Average futures.